Based on the Mnuchin comments, my expectation had been for a relatively quick settlement of the lawsuits against the government for its handling of Fannie and Freddie in conservatorship, followed by a reform and recapitalization plan for the companies that would have provided them with regulatory and capitalization schemes designed to maximize their effectiveness as mortgage guarantors. Such a result would have been driven both by the interests of shareholders behind the lawsuits and the interests of Treasury, which holds warrants for 79.9 percent of the companies’ common shares, and would have been in the best interest of mortgage borrowers. While the large banks and the political opponents of Fannie and Freddie would have objected to keeping the companies alive, without a workable legislative alternative they would not have been able to prevent it. On February 21, however, the U.S. Court of Appeals for the D.C. Circuit in the Perry Capital case unexpectedly (and inexplicably) held that plaintiffs’ statutory claims against the net worth sweep were barred by the anti-injunction provision of the Housing and Economic Recovery Act. Shortly afterwards two suits challenging the sweep in lower courts—Roberts in Illinois on March 20 and Saxton in Northern Iowa on March 27—were dismissed in opinions citing the Perry Capital decision. Still another lower court case, Collins in Texas, challenging not only the net worth sweep but also the constitutionality of the Federal Housing Finance Agency (FHFA) as a federal agency headed by a single director removable by the president only for cause, was dismissed on May 22. The Perry Capital ruling and the subsequent dismissals of other net worth sweep cases in lower courts halted whatever near-term momentum administrative mortgage reform might have had. Treasury had no justification for initiating settlement of a case it so evidently was winning—and that was bringing over $15 billion per year into its coffers—and without resolution of the sweep Fannie and Freddie cannot be removed from conservatorship. With administrative reform efforts stalled, the spotlight returned to the legislative side. On April 20 the Mortgage Bankers Association put out a white paper arguing (incorrectly, in my view) that legislation was essential to achieve the consensus objectives of “protecting taxpayers, attracting capital to Guarantors, and ensuring consumers and borrowers have access to affordable housing.” Then, on May 23, the American Bankers Association sent Secretary Mnuchin a paper (“Reforming the Housing Enterprises—Sustaining Homeownership and Protecting Taxpayers”) taking virtually the same position, while also advocating additional restrictions on credit guarantors and more benefits or flexibilities for primary market originators. Yet while the focus of mortgage reform may have changed, what hasn’t changed are the relative degrees of difficulty of legislating something new and untested versus administratively fixing something that already exists and has been proven to work. Legislative reform efforts never have been about devising a secondary market system that produces the lowest cost and most available mortgage financing for homebuyers; their core objective instead has been to remove or restrict two companies—Fannie and Freddie—whose operations have made it more difficult for large commercial and investment banks to exercise the control over and make the amount of money they wish to from the $10 trillion single-family residential mortgage market. For that reason proponents of legislative reform have as an unconditional requirement that Fannie and Freddie either be eliminated or altered to a degree that they no longer can operate as effectively and efficiently as they once did. Advocates for these changes may say publicly that they are remedies for a “failed business model,” but the reality is that they end up having to propose secondary market credit guaranty mechanisms that work less well than Fannie and Freddie now do, or have a risk of not working at all. Legislating the replacement of the known and proven with the unknown and uncertain always is difficult, and there are four factors that make it even more so in the current environment. The first is the extreme partisanship and divisiveness in both houses of Congress today. Second, setbacks to attempts by the Trump administration to replace the Affordable Care Act and achieve consensus on an approach to tax reform further complicate the task of knitting together a coalition capable of agreeing on and passing reform legislation. Third, there are fundamental, and seemingly irreconcilable, philosophical differences between the Senate and the House on whether there should be an explicit government guaranty on securities issued by the envisioned successors to Fannie and Freddie: the Senate supports one, whereas a significant number of members in the House insist that the future secondary market be “fully private,” with no government support at all. Finally, to put and keep the companies in conservatorship Treasury has had to single out their shareholders for unprecedentedly punitive treatment—forcing the companies into conservatorship, having FHFA add massive temporary or artificial accounting expenses to make them take unneeded and non-repayable senior preferred stock, and then, when the effects of the accounting expenses reversed, taking all of their net income in perpetuity. Advocates of “winding down and replacing” Fannie and Freddie through legislation seem to be wishing away the challenge of convincing investors to put up $150-$200 billion in capital for new and untested credit guarantors at the same time as the government is expropriating the capital previously invested in the two existing secondary market entities. For these reasons I believe it is highly unlikely that mortgage reform legislation can pass before the 2018 midterm elections (beyond which time prediction is foolhardy because of possible changes in the political landscape). It is tempting to conclude that the status quo will continue indefinitely, since it will be favored by Congress—whose leaders see it as preferable to administrative reform preserving Fannie and Freddie—and it also benefits the administration, which can keep the companies’ net income while publicly exhorting Congress to end the legislative impasse. Ultimately, though, the lawsuits make the status quo unsustainable. A number of cases related to the net worth sweep are still pending. There is the Jacobs-Hindes case in Delaware District Court, asserting that the sweep violates Delaware and Virginia law applicable to Fannie and Freddie and thus is void and unenforceable. An appellate court decision in favor of the plaintiffs in any one of four cases—Robinson in Kentucky, or Roberts, Saxton or Collins—would conflict with the finding of the D.C. District Court Appeals in Perry and trigger “a split in the circuit,” making it likely that the Supreme Court would hear and decide the issue. And just this past Thursday (June 1), a new suit challenging the constitutionality of FHFA was filed in the District Court in Western Michigan. While the timing on the final disposition of all of these cases is uncertain, and the appellate decision in Perry has reduced the odds of the sweep eventually being overturned, as long as any suit remains outstanding the government is at risk of losing it. Moreover, if the net worth sweep is upheld across the board the government still must contend with the breach of contract claims remanded to the Lamberth court in the Perry Capital case, as well as the regulatory takings charges in the Federal Court of Claims under Judge Sweeney. Breach of contract and takings are constitutional claims, the remedy for which is monetary damages. In the absence of legislation eliminating Fannie and Freddie they will remain at the center of the secondary market and become increasingly profitable. Were plaintiffs to prevail in one of the constitutional cases, particularly the takings case, requested damages could be staggeringly (and appropriately) large. I believe Secretary Mnuchin sees and understands this bigger picture. Even if he hadn’t already pledged to remove Fannie and Freddie from government control, he knows he has to take the initiative on mortgage reform while he still has some control over the outcome. With his path to administrative reform blocked for the moment by the Perry Capital decision, his only practical option is to work with industry leaders, lobbyists and members of Congress on the legislative efforts they now are pursuing. In doing so, however, he should and I think will set a high bar for what he deems to be an acceptable reform package. Treasury has a 79.9 percent stake in the two companies that have the best past record of secondary market performance and the best prospects for future success, but which Congress, under the influence of the banking lobby, is intent on phasing out or re-chartering. Politically motivated reform that replaces Fannie and Freddie with a less effective alternative would eliminate Treasury’s payments from the net worth sweep (for as long as they remain legal), make its warrants for the companies’ common stock worthless, and raise the cost and reduce the availability of mortgage credit for homebuyers. Those are not outcomes Mnuchin wants. While Congress tinkers with legislative reform, therefore, Mnuchin will continue to assess his options for administrative reform. In this regard, a plan released late last week by the investment bank Moelis & Company, which describes itself as “financial advisers to certain non-litigating preferred stockholders of Fannie Mae and Freddie Mac,” may well gain traction. The Moelis plan, titled “Blueprint for Restoring Safety and Soundness to the GSEs,” relies on Treasury and FHFA’s existing authorities to set new capital standards for Fannie and Freddie, strengthen their regulation, and prepare them for exit from conservatorship following a series of equity issuances over a four-year period. Moelis contends that its plan also would net taxpayers $75 to $100 billion from sale of Fannie and Freddie stock acquired upon exercise of Treasury’s warrants. I will have more to say about the Moelis plan in a future post; overall I find it to be very promising, but believe its fixed, bank-like capital standard needs to be refined in order to produce the business results Moelis is projecting, and to enable Fannie and Freddie to price their guarantees in a way that offers affordable financing to a broader range of borrowers. For now, though, the important point to make about the “Blueprint” is that it puts a concrete, third-party administrative proposal into the public domain for evaluation against the multitude of competing plans for legislative reform. To date there has very little substance in the debate about what to do with Fannie and Freddie going forward. Together with the interest and participation of the Mnuchin Treasury, the Moelis proposal should help change that, by serving as a catalyst to shift the mortgage reform discussion in Washington from inaccuracies, political rhetoric and name-calling to a serious analysis of the competing plans on their merits. When and as that occurs—as I believe it will—the optimism in my “Economics Trumping Politics” post about a fact-based administrative reform process prevailing over a misinformation-based political process should again seem justified, although it will take longer to play out than I expected originally. Care to add to this very sneaky MBA, Urban Institute, & Demarco plan to help TBTF banks realize $200 billion of regulatory capital relief – now exposed by Josh Rosner! I know in the past you said their plans weren’t feasible (ie, no real details) but this takes it to a whole new level of outright smoking gun theft!! Also this from the NAFCU. Things seem to be heating up. Tim said that he thinks there are advantages from doing things in the background. We can’t say for sure what he is doing that is helping us, but boy, would it feel better having more allies at all these housing reform discussions. Where did he say or imply this, Sebastian? Almost all of the work I’ve done on mortgage reform issues to date has taken the form of either posts and comments on this blog or meetings and written or verbal communications with key stakeholders and “people of influence” in the reform dialog. I generally don’t talk about the meetings and individual communication publicly, because I find I get more information and a better response to what I have to offer if I don’t broadcast them. My goal in these efforts has been to use my experience and knowledge to try to make various reform proposals work better for the homebuyers I believe they should be benefiting. I’ve not tried to get invited to committee hearings in either the Senate or the House (although I’ve had meetings with committee staff). I’ve done congressional testimony in the past, and found it’s very rare that you can convince anyone to change their point of view through what you have to say at a hearing. You’re better off working to educate and inform the opinion leaders, with the goal of having them be the ones to convince the members of the merits of your point of view. Thank you. Do you think Stevens will warm up to shareholders being part of any plan going forward? Thanks for your help in educating the opinion leaders on these housing matters. I’ve learned a great deal from your post and really do appreciate your efforts. The major players, in my opinion, such as Stevens, should realize that a mortgage war doesn’t benefit anyone, not even the large banks. It only leads to the detriment of the housing market, resulting lost opportunities for everyone involved in the housing market. I think Sebastian was referring to TH suggesting it’s better that Mnuchin is most likely working in the background. of course, folks attending an urban institute event, where for example mr. parrott landed, are the type to want this, and so i am suspicious. trump signed an executive order that instructed his administration to end financial bailouts. how can one say that an explicit federal mbs guaranty is consistent with this executive order, as by guaranteeing the mbs security you are telling the investor in advance that the investor can count on the federal bailout if the security defaults. my sense is this is tbtf/mbs investor PR pushback against the moelis plan. These clowns are all playing with fire that they don’t understand, not smart. How did your meeting with David Stevens go? We’ll be meeting next week. back to the notion that some form of compromise is likely in this tortured housing finance reform journey, understanding that the GSEs have 6 months before they go zero capital (i understand that corker thinks that the GSEs have $250B of capital but he is wrong and i think importantly the administration thinks he is wrong). i wonder if in your discussions with stevens it would make sense to explore a timeline that you both could agree to in which implementation of the moelis blueprint is given an immediate go ahead, so that the GSEs begin their return to soundness and safety (understanding that treasury is on the verge of having been paid back with 10% interest in accordance with the original deal terms), and then over a longer time frame, some process is put into effect whereby the type of competition to the GSEs that the MBA seems to want is carefully crafted beyond the mere idea stage. this fleshing out process would require significant time and care since MBA seems to have run out of steam at the idea stage (and MBA is precisely the group most incentivized to offer up a more carefully detailed plan), whereas the moelis blueprint is ready to be implemented (and given the zero capital near term horizon, thankfully so). so let’s not have an either/or situation, but implement what history has shown works and makes sense now, and think through carefully the possible unintended consequences of what might make sense over time. in particular, i thought the comments that moelis’s parsons made in the cato presentation (anon-e-moose supplied link above) are noteworthy, regarding the unintended consequences of alternative reform schemes. he pointed out that if an explicit federal MBS guaranty were put in place, ginnie’s would lose their scarcity value and interest rates on loans wrapped by ginnie mae would go up, hurting the very borrowers that much of housing reform efforts seek to benefit. so the notion is that with the capital clock running out, why not go dual track: implement the moelis blueprint now, and take a careful look at a supplementary scheme that doesnt just provide MBA payback on its constituent members’ political contributions, but actually is a well-thought out and fleshed out proposal. i would think that the underlying reason why conservatorship has lasted almost 10 years is precisely the absence of good common sense in congress to realize that the second track should follow on the implementation of the first track. however, deadlines can have a salutary purpose. A new lawsuit is filed in MN, which is similar to Western Michigan case Rop vs FHFA. Will both be delayed by multidistrict litigation (MDL) panel? i took a quick read and there seems to be substantial overlap between minn case (bhatti) and rop in michigan. so i do expect fhfa to seek to consolidate. frankly, i think plaintiffs would be well advised to beat fhfa to it if they think one venue (or judge) is better for them than another. “New information in the Bhatti case. He’s a paid lobbyist and you’re an expert contrarian. No offense to either, but good luck with lunch. Question for Tim or anyone interested in commenting. If Congress were to pass GSE reform soon, would that passage be binding? Let’s say they choose a plan that is deemed detrimental to housing by Mnuchin. Would he have to go with it or can he opt for a better plan if he were inclined to do so? Beyond that, Warner is talking about the MBA, the Urban Institute and the Milken Institute being “at least in the same room.” I’m not sure that’s really true anymore. Jim Parrott claimed in an article he wrote for the Urban Institute in March that all three proposals differed only with respect to what to do with Fannie and Freddie and whether the Common Securitization Platform or Ginnie Mae should be used to issue the government-guaranteed securities, stressing that each proposed that the new credit guarantors “distribute all or most noncatastrophic risk” to capital markets investors “at time of origination or after pooling.” Since then, though, the MBA has endorsed an equity capital based version of credit guarantors, and a growing number of commentators have written about the problems of credit transfer securities as substitutes for equity. And all three proposals continue to be extremely vague on how to solve the vexing problems of transitioning from the current system based on Fannie and Freddie to a future system without them. This is a material change in view from completely trying to replace Fannie/Freddie. It seems even the strongest proponents against the GSEs are coming to realization that any new system involves Fannie/Freddie sticking around. Joe Light reported it on Bloomberg. Not sure there’s a public link, its on the terminal. See below for full piece. (Bloomberg) — Sen. Mark Warner, D-Va., says the Senate Banking Committee is likely to debate how to overhaul the housing-finance system, including Fannie Mae and Freddie Mac, before trying to revise the Dodd-Frank Act. And what private capital will invest in that intellectual foundation if the current ones are left out of that discussion? Taxpayers should be a part of that discussion as owners of the warrants. In the Bloomberg Berkowitz interview this morning, he says both that he should have filed a “constitutionality lawsuit” and prior to that he says he hasn’t filed one “yet”. At this stage of the game, can he still file either an altered one or a new lawsuit – or have the statute of limitations passed? Earlier this month on June 1st, a new suit challenging the constitutionality of the FHFA was filed in the District Court in Western Michigan. Additionally, the takings claim in the Federal Court of Claims, which is trending somewhat favorably for shareholders, is addressing a constitutional issue and we should expect a ruling there sometime in 2018. My guess is that perry and fairholme counsel thought the APA claim was strong enough so that const claim was superfluous. Spsitob is right about Rop case in Michigan and if another such case was filed they would simply be consolidated somewhere. If fairholme thinks there is a better venue to bring case then it might want to do that and ask for consolidation where it brings suit. IMO best place would be federal circuit where the best const appellate justices are. Hi Tim. The Moelis plan in part consists of raising new capital by issuing more stock. Given the precedence that has been set by the government (that they can change the rules at will in endeavors like these), if Moelis or a similar plan is chosen, do you think there will be willing investors to provide long term capital? Even if the government honors current shareholder rights, is it possible that attentive investors will be wary of doing private/public ventures again given the years of uncertainty and lost profits of the conservatorship? Perhaps Mnuchin knows this and would rather allow the GSE’s to go into conservatorship and nationalize them even if the preferreds held by the government go to zero? Since they can take profits indefinitely anyway? Could it be too late now even per the Moelis plan to be able to bring in the private and permanent capital necessary to “protect” the taxpayer given how the last set of capital providers have been treated? Who in their right mind would provide the capital given what has transpired in the courts and how the government has been behaving as a partner for this very capital. This is all mind numbing to say the least. Thank you for your diligence on what I think is on behalf of all the homeowners in our country! In the Moelis plan, in exchange for the monetary value of exercising the warrants Treasury agrees to end the net worth sweep and also eliminate the liquidation preference it has in the companies through ownership of $187 billion in non-repayable senior preferred stock. The authors of the plan believe that with these actions by Treasury, investors would be willing to provide the $80 billion in new common equity required to make the plan work, and in support of this contention state, “existing shareholders representing substantial private capital are prepared to help the GSEs build capital as outlined in this blueprint.” Since I know Moelis has been speaking with a wide range of investors–not just the “non-litigating preferred stockholders of Fannie Mae and Freddie Mac” who have retained them as advisors–the authors’ confidence in the feasibility of their proposed recapitalization plan should be viewed and assessed in that context. Thanks for your response. You make the solution sound easy! My main concern is that as each day goes by and we watch and wait for the government and our courts shuffle along, doesn’t it make it more and more difficult to get the much needed private capital in front of the taxpayer thus hindering stated objectives? Said another way, the way they are trampling all over the last set of shareholders how can they secure any private capital with a government partner that can, has and potentially will again if the basic rules and fundamentals don’t stand? Our capital markets are being tested and we should all be growing increasingly concerned. i wholeheartedly agree, but along the lines of wc fields, there is a lot of stupid capital…see how greece sells its bonds. moral hazard built into that trade. it has been pointed out to me that if greece can stay afloat, then why not a gse-successor which grows on the compost of the rule of law. Yellen today – Fed stop buying $4 billion MBS per month. That’s $12 Billion per Q. Would there be any implication here for the GSEs? At least initially, there should be no implications for Fannie and Freddie–and little discernible effect on mortgage rates– from the Fed’s announcement yesterday that it will begin reducing its $1.7 trillion in holdings of agency mortgage-backed securities by $4.0 billion per month, gradually stepped up by an additional $4.0 billion each quarter until the monthly liquidation rate reaches $20 billion. The Fed began buying Fannie and Freddie’s MBS shortly after Treasury required them to start shrinking their portfolios when they were put in conservatorship. To date the Fed’s holdings of these MBS have more than offset the shrinkage in the companies’ portfolios, so there has been no impact on mortgage rates from Fannie and Freddie effectively exiting the portfolio business. Now that the Fed also will be winding down its holdings, however, that will begin to change. The Fed knows this and wants to minimize the impact its liquidations have on the market, so it’s starting them off at a low level, and ramping them up fairly slowly. To put the Fed’s MBS liquidations into perspective, last year Fannie and Freddie together issued a little over $90 billion per month in mortgage-backed securities (Fannie $53 billion and Freddie $38 billion). The Fed’s liquidating $4.0 billion in agency MBS per month won’t add that much supply to the companies’ $90 billion monthly issuance rate. As the Fed’s liquidations rise towards the $20 billion per month level, though, we could see some macro effects– particularly if at the same time administrative or legislative mortgage reform is done in such a way as to raise Fannie and Freddie guaranty fees (and mortgage rates) even higher than they are now. From this latter perspective, therefore, there could actually be a positive effect on Fannie and Freddie from the Fed’s decision to begin running off its $1.7 trillion in MBS. The Fed’s holdings are 17 percent of the total ($10 trillion) single-family mortgage market. The Fed’s shifting from being a tailwind helping that market to a headwind impeding it strengthens the argument of those who want to do mortgage reform in a way that makes the secondary market more efficient in support of homeowners (to help offset the Fed’s gradual withdrawal of that support), rather than to make the secondary market less efficient to give more of the mortgage business to banks. Tim- Any insight into Brian Brooks and how he may influence GSE/Housing reform with his new role at Treasury? No, not really. The fact that he has been General Counsel at Fannie Mae for two and a half years should be a positive, though. As a member of the company’s leadership team he will have had exposure to how Fannie thinks about and manages its business, which will give him a leg up on most of the other people at Treasury (at least some of whom get much of their information about the company from what they read in the Wall Street Journal, which often is inaccurate–at least about Fannie). Tim have you seen the Treasury report? It seems like the MBA plan is being favoured. While it doesn’t address housing reform, UST says that they want to attract private capital into mortgage lending, aside from risk transfer transactions, through the PLS market. UST also wants to fix certain regulatory issues such as the QM Patch that benefit the GSEs vs non-GSEs. All-in-all, seems like the proposal is talking about reducing GSE market share but it doesn’t go as far as to back the MBA proposal IMO. Separately, the report is extremely harsh on CFPB’s current structure, claiming the agency wields too much unchecked power. Mnuchin also said on FOX this morning that much of the financial-regulation reform eyed by President Trump’s administration can be done without need for congressional action. Not directly related to Housing reform, but interesting to see Mnuchin/UST say they are willing to act without Congress on some issues. seems to me that treasury report skirts the essential issue re reviving the PLS market, and that is a Treasury MBS-level guaranty. clearly it indicts CFPB on its regulatory stance on mortgage lending, but if there is going to be a PLS market, imo, Treasury needs to swallow the risk of a MBS guaranty, and i dont see that discussed. Tim, Where do you see all this going in the end? This is all politics and nothing to do with finances. Unfortunately, Fannie and Freddie ARE affected by a lot of politics. They were put into conservatorship because of politics–not their finances– and even should they prevail in one or more of the lawsuits it will take some type of political act, whether administrative or legislative, to get them out. In this post I tried to analyze whether the fates of the companies would be determined by a legislative act eliminating or re-chartering them or an administrative act reforming and releasing them, and came down on the side of the latter. The financial details of how that might happen, however, are not foreseeable at this point, because there are too many moving parts and uncertainties. As I said in a response below, I seriously doubt that Watt would stand in the way of an administrative plan for reforming Fannie and Freddie and releasing them if Treasury and the Trump administration back a specific plan to do so. Mnuchin has said repeatedly that his “strong preference” is to work with Congress, but that he will act unilaterally if necessary. I take this to mean he will not put forth an administrative plan until after he becomes convinced that Congress won’t be able to come up with a workable reform plan itself. Assuming that Mnuchin determines that an administrative path is the right one, therefore, I very much doubt Watt will oppose him. What would be Watt’s basis for doing so? Moreover, I’m sure Watt knows that his position as a single-person head of a federal agency not removable by the president other than for cause is now under legal challenge, not just in Count IV of the Collins case in Texas (dismissed in lower court and now on appeal to the U.S. Court of Appeals for the Fifth Circuit), but also in a newly filed suit in the Western District of Michigan. This latter case uses the Perry Capital decision to highlight the fact that as the APA cases now stand, FHFA is free to manage Fannie and Freddie in a way that advances its own interests and no one else’s, and that this clear “lack of an intelligible principle to guide FHFA’s exercise of its discretion” is not subject to any judicial review whatsoever. As counsel for plaintiffs in the Western Michigan case make clear, there is ample and compelling legal precedent that an independent single director of a federal agency with unlimited discretion, no legislative guidance, unaccountable to any member of the executive branch and exempt from judicial review is unconstitutional. Watt’s refusal to go along with an administrative reform plan advocated by Treasury and the Trump administration would put him squarely in this legal bullseye. Finally, if neither of the first two analyses turn out to be correct, Watt’s term ends in January 2019. As do all trade groups, The Mortgage Bankers Association advocates for the interests of its members, and since the mid- to late 1990s the concentration of mortgage originations in either divisions or subsidiaries of large commercial banks has resulted in the MBA pushing for the agenda of those large banks (who pay the majority of the MBA’s dues). 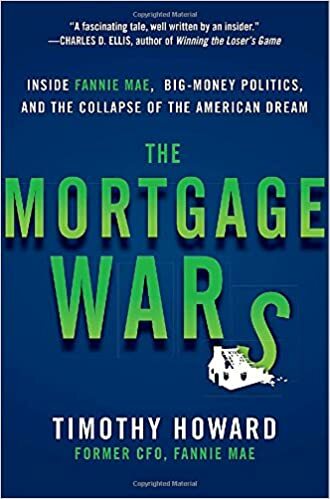 As I wrote in my book, The Mortgage Wars, Fannie, Freddie and the large banks had a mutually beneficial and profitable relationship–with the companies’ efficient business processes and low guaranty fees allowing the banks to originate, sell and service huge volumes of 30-year fixed-rate mortgages–but that relationship was fraught with tension over the fact that Fannie and Freddie’s control over underwriting standards and pricing limited banks’ abilities to “brand” their mortgage products in a way would enable them to distinguish their mortgage offerings from their competitors’. Fannie’s Chairman and CEO, Frank Raines, once compared Fannie and Freddie to Coke and Pepsi as manufacturers of product, with originators being the bottlers of that product; the analogy was apt, but not well received by the parent companies of the originators, who didn’t like being, or to be perceived as being, in that subordinate position. A fight began between Fannie, Freddie and the large banks for control over the entire mortgage market, with the MBA taking the side of the banks. As often happens in these situations, winning the fight took precedence over everything else, including the side-effects and consequences of the fight–one of which was the rise of the unregulated private-label MBS market, whose excesses and subsequent implosion led to the 2008 housing and mortgage market meltdown–for the participants themselves. That fight is still going on, and the objective is still winning (at least for the large banks–Fannie and Freddie aren’t able to fight anymore because they’re in conservatorship). But I also think the large banks feel they will benefit even if the result of getting rid of Fannie and Freddie is a much less efficient secondary market credit guaranty function. Commercial banks now hold $3.7 trillion in single-family whole loans and MBS in portfolio–nearly 40 percent of that $10 trillion market. A less efficient secondary market will result in higher rates on 30-year fixed-rate mortgages, which will benefit banks in two ways: first, as fixed-rate mortgages in their portfolios refinance they will be able to reacquire them at higher spreads to their (government-guaranteed) consumer deposits, and second, with higher 30-year fixed mortgage rates adjustable rate mortgages–which banks can fund with those same consumer deposits without taking as much interest rate risk– will become more popular. So in short, no, I don’t think the banks will regret getting everything the MBA is asking for– but homebuyers will. Yes, I saw this when it first came out, and thought Josh made some very good points in it. Is the Moelis plan’s success entirely contingent on whether or not Mel Watt acts and stop taking sweep payments? Is there no backup mechanism if Watt never acts? This is purely an opinion, but I do not believe Watt will hold up something like the Moelis plan if Treasury gets behind it. While FHFA technically was the agency that put Fannie and Freddie into conservatorship, the idea of conservatorship and the activities and initiatives required to force the companies to accept it were entirely the doing of the Bush administration Treasury, under Hank Paulson. And Treasury has been calling the shots for how FHFA has been managing the conservatorship ever since. I think Watt’s statements about “I won’t pull Fannie and Freddie out of conservatorship without reform legislation from Congress” is really a way of him avoiding having to say, “I won’t take the companies out of conservatorship unless and until Treasury gives me the green light to do it.” Again, this is just a feeling I have, but I think if Mnuchin wants to “reform, recapitalize and release” Fannie and Freddie, Watt will go along with that. Thanks for your reply. Yes – “making”! I believe for “political reasons”, the less we talk about “reform, recap, and release” the better for a positive path forward for the GSEs. For the uneducated (politicians), the 3 Rs might easily be misled by the GSEs adversaries as keeping status quo. Both Mnuchin and Watt have been forced by Crapo and others in testimonies to deny any attempt to recap and release of the GSEs. Is it possible that Mnuchin and the Trump Administration would actually reveal truths to the public about the artificial accounting in a way that would bolster support for administrative reform vs. legislative reform? A sound strategy would be to prove the accounting improprieties so that public perception is altered through factual document revelation. When I say “alter public perception”, what I mean is to actually be honest and transparent about the financial history and conditions of Fannie, Freddie. Clearly, this is a huge reason that 11,000+ documents were and still are concealed. Berkowitz has referred to the cover-up as “The Big Lie”. The Trump Administration needs to be transparent with the American people so that Too Big To Fail banks can’t keep trying to line their pockets by means of financial misrepresentation. If the Trump Administration is reading this blog, bring honesty and transparency to the mortgage finance discussion. The Trump administration certainly could release all 11,000 documents related to the net worth sweep case, but I don’t expect it to. At the moment it’s winning the suits against the sweep, and is benefitting from over $15 billion per year in sweep payments. More likely is that most of the documents are turned over to plaintiffs’ counsel (and its consultants), and that some of them then get released from their protective order by Judge Sweeney. If and as that happens, public perception of the companies and their relationship to the financial crisis could well change, as you suggest. You think those documents will see the light of day for either permission or forgiveness for POTUS/TS if plan resembles current model or the Moelis paper? Without the supposed corroborating proof proving NWS unnecessary etc, admin would get vilified for a release. Onus would then fall on opponent’s not only to refute docs but also to submit and defend their as of yet defined proposals. Documents and GSE’s imo anyways seem mutually exclusive as to whether they’ll come up for air. If GSE’s remain under c-ship, imho, docs remaining under EP will prove to be canary in coal mine. Thanks for your time, boss. I don’t expect the 11,000 documents will tell us much more about Treasury’s motives for entering into the net worth sweep (to prevent Fannie and Freddie from rebuilding capital as the effects of temporary or artificial book expenses put on the companies’ books in 2008-2011 reversed and turned into income) than we already know from earlier document releases. What’s happening in the debate now is that opponents of keeping Fannie and Freddie at the center of the housing finance system refuse to acknowledge these facts, and instead are sticking to their (readily disprovable) claims that the companies were the cause of the financial crisis, needed $187 billion to survive it, and are a “failed business model” that under no circumstances should be allowed to emerge from conservatorship. The general public believes this to be true (having read it in the media for nearly nine years), so members of Congress who support a bank-centric secondary market have the advantage of being able to claim they are giving the people the outcome they want. If Treasury does end up endorsing administrative reform of Fannie and Freddie (as I expect it to), I would be surprised if its advocacy strategy includes a “document dump” intended to discredit prior government actions taken with regard to the companies. I have two reasons for thinking this. First, there would be very strong institutional resistance at Treasury to “throwing itself under the bus,” even if it thought it could blame prior administrations for past misdeeds (which isn’t easy—Treasury actions designed to impede or eliminate Fannie and Freddie go back to the Reagan administration, and include Bush 41, Clinton, Bush 43 and Obama). Second, though, a “fessing up” still wouldn’t cause the large banks and their supporters who oppose keeping Fannie and Freddie alive to change their stance. I think that instead the Mnuchin Treasury will argue for its administrative reform plan on the merits—saying that it’s better for homebuyers and the economy than any plan anyone else has come up with, and claiming that any past problems with the companies (real or invented) have been adequately dealt with in the Treasury plan. i wonder if cutting to the chase, the MBA, corker/crapo/warner etc opposition to GSE reform falls away if, in addition to GSE reform along the lines of the Blueprint, an MBS-level explicit catastrophic guaranty is implemented for the PLS market? put another way, if mortgage banks can either sell mortgages to GSEs revived as per the Blueprint, or to their own PLS supported by a catastrophic govt guaranteed program (funded by means of cash flow from the PLS that obtain the govt guaranty), then is that a fruitful compromise? while one may prefer simply a GSE entity level line of credit, as per Moelis’s Blueprint and per what you have been advocating for, can you see your way to incorporating a “second way” PLS alternative into a reform package? this would raise many issues i am sure, such as the nature and extent of fhfa regulation of these PLS issuers. but i would be interested in your thoughts on whether this might make sense (and if you think it might offer a path to break the housing reform logjam). A full discussion of the arguments for and against “an MBS-level explicit catastrophic guaranty…for the PLS [private-label securities] market” would take a full post, but let me try to hit the highlights in a much shorter reply. And it gets worse. Even if you could define the terms, “unexpected” and “catastrophic” credit risk vary greatly depending on the characteristics and diversification of groups of insured mortgages. Clearly a pool of 60 percent loan-to-value ratio mortgages with a minimum credit score of 740 will have much lower catastrophic risk potential than a pool of 95 percent LTV loans with a maximum credit score of 680. With this as background, it’s a little easier to see why an explicit government guaranty on pools of private-label securities is such a terrible idea (as we saw during the 2005-2007 period leading up to the mortgage meltdown). The biggest problem is the limited diversification individual pools of mortgages have. Even with strict limits on underwriting, you are going to have some pools with higher average quality mortgages and some with lower average quality mortgages, and there will be pools from “good origination years” (typically years when average home prices are low compared with median family incomes) and loans from less good, or bad, origination years (when homes are “fully priced” or overvalued.) Given this wide variation of potential credit performance, at what level does the government have the catastrophic loss guaranty kick in? If you set that loss threshold to keep the government from ever having to pay out on its guaranty, your fee will be unreasonably high for the vast majority of pools, and you’ll get very little business. But if you set the threshold too low, the government will be routinely making non-recoverable payments on guarantees for pools whose only real problem is that they’re riskier and less diversified than the average of all pools from all areas and origination years. I’m not a fan of an explicit government guaranty for any secondary mortgage market mechanism, but a pool-level guaranty, whether for PLS or conventional loans, is simply not workable in the real world. I understand that there are lots of people pushing for it, but that doesn’t make it a good idea. thanks for reply. i am just trying to see a way to fix the GSEs along the lines of the moelis blueprint, and offer as a compromise an additional secondary market mechanism that might meet MBA’s objections to the moelis Blueprint. if you stand in the MBA shoes, moelis Blueprint reformed GSEs would benefit from the continuation of the treasury preferred stock line of credit. it is difficult for PLSs to compete with that if the banks want to try to revive that market. while i get your point about where to set the parameters of catastrophe, i would think that some tranching structure could be set up where only super senior tranches would be guaranteed, such that a meaningful amount of losses must have been incurred on support tranches in order for the govt guaranty to kick in. just generally, whenever there are policy disputes, some form of compromise is usually needed for resolution. i would rather have that compromise made in the form of an alternative to GSE reform rather than to muck up GSE reform. as you know, that is the political/washington dc way. getting GSEs reform right seems to be a big get, and if there has to be an alternative methodology set up in order to do GSE reform right, then maybe that would be the price to be paid. another form of compromise would simply permit banks to set up one or more monoline insurers that would have access to the govt preferred stock line of credit that would continue to be available to the moelis blueprint-reformed GSEs. a final thought would be simply to provide that bank investment in securities issued by moelis blueprint-reformed GSEs would receive favorable treatment from a regulatory risk weighting point of view. let the banks invest in the reformed GSEs and get a more favorable risk-weighted return than treasuries. there are more ways than these to skin a cat, i am sure. How would your suggestion, quoted below, appeal to those currently controlling Congress, who want Uncle Sam’s market presence to be smaller, not greater?? Doesn’t that move in the opposite direction? I don’t know what the MBA’s objections to the Moelis Blueprint are (I hope to find out when I meet with Stevens, although perhaps he or his staff will make them known publicly beforehand). The continuation of the Treasury backstop is an aspect of the Blueprint I’m not wild about, either. I agree that compromises will need to be made to resolve the status of Fannie and Freddie. But not all compromises are good ones. One role I’m trying to play is to use my knowledge of and experience with how the credit guaranty business actually works to critique plans put forth by people whose background and objectives are more political, and who therefore may be proposing things they don’t fully understand. I may not always convince people (and I’m sure at times also may miss something), but I’ll keep aiming to get as much fact and reality into the debate as it can tolerate. given that MBA banks have paid fhfa some $18B to settle putback litigation, MBA’s objection may be more to the GSEs, full stop, than the moelis blueprint. which is why i can see as a fruitful compromise carving out some sandbox for the MBA banks to play in, so as to leave proper GSE reform to proceed. Was that the real David Stevens, and was he actually open to discussion with you, or did it turn out to be a phony/hack job? That was the real David Stevens, but he asked me to remove his comment because he was getting too many ad hominem tweets and emails after he posted it. (I try to discourage that on this blog). We will be meeting after both of us return from trips around the middle of the month. Great news! Enjoy your trip & good luck when u meet with him – leave no stone unturned. Thanks from fellow shareholders!! Tim, I dare to speculate that David Stevens and others on his team have been following your blog closely since you started to write on this website. I have no doubt they’ve also read your book ‘Mortgage Wars’. Your thesis on the GSEs and housing reform has been laid out here with impeccable logic grounded in reality and experience. Your position is clear and David knows it. It is strange that he now decides to invite you to talk (being the first one to post in the am), where he wants to present his perceived, multiple gaps in Moelis proposal to you. He’s certainly not on the level of your expertise, you being the CFO of Fannie Mae for a long period of time. David’s behavior falls in one of two categories: one, he’s either on tilt (Poker Term) feeling like he’s losing his influence on the GSE issue, or two, he’s looking to probe you for information that he can twist and manipulate to his & MBA’s advantage. If it’s the first, what possible advantage do you have to derive from meeting with him? And if it’s the second, then his nefarious intentions will only serve to use your name and clout to justify their position, twisting your logic and confusing people along the way. Why would you put yourself in that position? I’m confident he had ways of reaching out to you prior to today and he could certainly point out the gaps in the Moelis proposal publicly if he really believed in them strongly, instead of dismissing the proposal outright with snarky comments. You may be over-analyzing this. I quoted David Stevens in my post, noted that he “offered no specific criticism of the [Moelis] plan,” and he responded with a comment (since removed at his request) proposing to meet with me to discuss his position. I’m happy to do that. I don’t need a “possible advantage to derive” from the meeting, and see little downside from exchanging viewpoints. Hopefully you’re right. If possible, please update us on his position after your meeting. It would be great to understand if there is any substance to MBA’s views on the Moelis plan. The broad strokes of that blueprint are well articulated and fortunately it leaves room for some calibration on the numbers after all practical/economic viewpoints on GSE reform are considered by the Treasury. Yes. Thank you. This tack demonstrates civility and good faith…two qualities regrettably too infrequently displayed in GSE discussion and debate (but which Tim Howard, at least, *has* consistently exhibited). Thanks for this post Tim! I still don’t see how any institution can replace the business model that F&F provide in term of scope and scale…Do you believe that the government has an optics problem when it comes to just letting these two institutions return to the market? Meaning will there be political backlash as they were wrongfully blamed for the recession..once blamed for something so catastrophic it becomes almost impossible to reverse the negative cloud that follows it. Will it take a court decision that favors plaintiffs to make the government change course and how would this affect a legislative change to the business? The business continues to provide the solution to the secondary market even in c-ship and I, like most, believe the only issue is retained capital in the business. I still believe that if the government decides to wipe out current shareholders it would become extremely difficult to raise capital in the future. What fiduciary would invest in shares of a company that had previous wiped out former shareholders? Thanks for providing us with great insight and loved your book! I tried to address most of these questions in the post. I think it WILL be difficult for the government to “just [let] these two institutions return to the market.” That’s why (a) the Moelis proposal is so significant–although the firm was retained by preferred shareholders, it’s a third party making an analytically based recommendation, and (b) Mnuchin needs to, and I think will, see what Congress can come up with before moving to embrace an administrative solution. I also think that if you begin to get a public dialogue that addresses competing reform proposals on their merits, more real facts about Fannie and Freddie, and the roles they played in the crisis, will become more generally known, helping to pave the way for the return of the companies to the center of the system as independent, shareholder-owned entities, but with regulatory reforms and higher capital standards making them sufficiently different from their prior incarnations to give them standing and support. A court decision would be helpful to move the process along, but I don’t think it’s essential as long as there remains a credible chance of a ruling favorable to the plaintiffs at some point in the future. Along those lines, do you see any threat of the warrants getting challenged given the “success” of the NWS in already having returned the original “investment” with interest to the Tsy? I realize Ackman was willing to forgo them in his original plan, but his plan took a non dilution approach to recap, spread over considerable years (7-10?) with the use of G fees that I think you found disagreeable. I’m not so sure he’d go along with warrants under a dilution scenario such as this one envisions. Secondly and very much related, this new plan being floated about offers its views on warrants, with an average implicit strike price that would generate up to 100 billion for the Tsy, a max average of just short of 14 pps. Obviously such commentary isn’t part of housing reform per se but in a real sense just an enticement for a deal. Warrants typically are couched as part of the original bailout terms by pfd hedge funds as they try to entice deals this way. Would you care to comment on the original *purpose* of the warrants even as it relates to the NWS, maybe in light of other government bailouts too? Then maybe you might be willing to tie those thoughts on their original intended function back into my original query regarding the potential of warrants being challenged in court? It’s clear to me that the original purpose of the warrants was to knock down the price of Fannie and Freddie stock (by a factor of five) in order to make the companies appear to be more troubled, in support of Treasury’s goal of legislating them out of existence. At the time the warrants were granted (by Treasury to itself), Treasury had no thought or expectation of ever exercising them, because it didn’t intend for the companies to survive. The warrants HAVE been challenged in one court case–Washington Federal, in the U.S. Court of Federal Claims– but that case has been stayed pending discovery in the Fairholme suit, which challenges the net worth sweep but not the terms of the original conservatorship. The cases against the net worth sweep filed in U.S. District Courts (challenging the implementation of the sweep under the Administrative Procedures Act) don’t address the warrants either. Now that some (including plaintiffs in the net worth sweep lawsuits) are focusing more attention on the potential for administrative mortgage reform, the warrants have taken on a new role. Plaintiffs are highlighting the value the warrants could have to the government if it chooses to keep Fannie and Freddie alive as going concerns, rather than re-chartering them or eliminating them in legislation as the companies’ critics want to do. Whatever current holders of Fannie and Freddie common stock may think about the “fairness” of rewarding the government for improperly (and many would say illegally) forcing two private companies into conservatorship and taking four-fifths of their value, the reality is that plaintiffs in the net worth sweep cases believe the government must have some incentive allow Fannie and Freddie to escape from conservatorship, and the warrants are that incentive. The prospects for a successful legal challenge to the warrants do not appear to be particularly bright. As of now plaintiffs in the suits against the government are losing ALL the cases. Even if they prevail in one of the remaining sweep cases I identify in the post, the remedy likely would be unwinding the sweep by characterizing sweep payments in excess of the 10 percent quarterly senior preferred stock dividend as pay-downs in the principal of the senior preferred, leaving the warrants intact. The Washington Federal suit was filed by a law firm working on contingency, who most observers feel is very unlikely to be willing to devote the resources necessary to push that suit to a final resolution. So, while we should “never say never,” at the moment we would seem to require some serendipitous and unforeseen new legal development for warrant cancellation to become a plausible possibility. Yes, I don’t question a hidden agenda behind the the warrants, which was to drive price down etc. Nor do I question the notion that the government never imagined that the GSEs would’ve survived all their insidious attempts to sink them. That said, wouldn’t the rationale by which the government would try to exercise the warrants have to be along the lines privileged risk-return i.e. pure profit? Yet isn’t that rationale at odds with what *should* have been the original purpose of the warrants, to retrieve the cost of the bailout? So, given the “success” of the NWS in retrieving the bailout (and then some), it seems to me there’s an outstanding case looming against the warrants. Indeed, the courts haven’t been our friend but in essence, haven’t we only lost on one major premise, though repeatedly? They deny that HERA limits the FHFA. We haven’t lost the more fundamental constitutional questions that would include the warrants I’d think. Either Congress violated the law or the judges misinterpreted their law. I think the latter. Still hopeful, especially in light of discovery. “Probability of the Enterprises and the FHLBs fulfilling the terms of their obligations – The structure of the PSPAs, with their liquidation preference over all other equity, including preferred equity, combined with the PSPAs’ restrictions on debt issuance, enhance the probability of both Fannie Mae and Freddie Mac ultimately repaying amounts owed. Thank you for this new post and all commenters. Regarding Moelis/MBA plan… there is main, noticeable difference which in my view makes it or break it. Moelis, as well as ICBA both uphold shareholders’ rights. Whereas Mr. Stevens has publicly said MBA’s plan is agnostic. It is not that “agnostic” will not cut it. Agnostic really means that the “old and tired rule of law” continues not to exist in Mr. Stevens’ book. The starting point of ANY discussion should be respecting shareholders’ rights. Tim: the ICBA GSE White Paper released in April is gaining traction on the Hill, in part because Members of Congress (rightfully) don’t want to be aligned with a plan that hands over the US mortgage secondary market to Wells et al. In addition, all community lender trades, as well as consumer & civil rights groups, and builders, are calling for immediate operating capital on the GSE books. So is the prudential regulator, who has identified the lack of capital (LOCs are never capital) as a safety and soundness issue. There is a long, long precedent in town for policymakers and industry lobbyists to defer to a prudential regulator on identified safety and soundness calls concerning regulated entities. It’s Finance 101 and Politics 101. Rob: I’m glad to hear about the reception on the Hill to the ICBA white paper. I thought it was a valuable contribution to the dialogue. As I’m sure you noted, the authors of the Moelis proposal referenced the ICBA piece favorably. For what it’s worth, an ICBA representative was at the Barclay’s GSE reform event last Friday (Fairholme, Cooper & Kirk, and Moelis were the key panelists), and he openly supported the Moelis plan as well. It seems as if the feelings are mutual between the two. readers of this blog are pleased to see that you and tim will have a discussion on the topic. if you both agree that this discussion should remain private, that is quite understandable, though i would encourage both of you, whether together or separately, to provide us the benefit of the wisdom that you derive from this exchange. i understand that press releases are little more informative than tweets by limitation of space, but why limit yourself to a press release? i would encourage you to defend publicly why the MBA plan should be taken seriously by congress and the administration, in comparison to the Blueprint, when it destroys as much as $100B of value for treasury (per Moelis) and creates for treasury potentially massive liabilities by means of direct MBS-level guarantees. Will the MBA plan call for some $150B of private capital to stand before another treasury bailout, as per the Blueprint? if so, the MBA plan hasn’t explained, in terms understandable to someone who knows finance, how that would be done. the Blueprint has done so in detail. one would think that execution of the Blueprint will result in billions of dollars of underwriting fees for your clients. that sounds to me like a favorable outcome for your clients. maybe this time around, by using the Blueprint as a point of departure, both the taxpayers and your clients can win. is that too much to ask? David: I’d be happy to meet with you to discuss the MBA’s plan, the Moelis plan and the state of play in mortgage reform in general. I’m heading out for a short trip to the west coast this Friday, but will be back mid-month and we can set up a meeting then. Mr. Stevens. If you are glad to discuss the plan please accept Josh Rosner invitation for moderated debate. Nice writeup of where we stand. I just had one question. You often cite Mnuchin as the one who knows something and would or would not want to take certain action, however isn’t it Craig Phillips that is in charge of housing reform? Phillips has the power to make his own analysis and present them to Mnuchin, who then uses the potentially biased findings from Phillips to make his decisions. Mnuchin has made very clear that removing Fannie and Freddie from government control is a top personal priority of his, and that he believes he has the knowledge and experience to accomplish that successfully. Phillips works for Mnuchin and will play an important role in this effort, but I don’t agree with the notion that Phillips might have any reason or ability to attempt to misinform or mislead Mnuchin about the mortgage reform issues Treasury will be analyzing, discussing and deciding upon. one benefit of having mr. phillips act as mr. mnuchin’s lieutenant is that when treasury, with or without congress, eventually proceeds on a massive capital raising program along the lines outlined in the Blueprint (this would be treasury’s bailiwick, fhfa has no expertise in capital raising), that program will need to be shepherded through wall street by a knowledgeable and experienced banker, adept at finance both generally and specifically in mortgage finance…and mr phillips fits that description.